Have you been lately to the Rocks? I was there last Saturday. As I had some time to spare before the general meeting of the NSW Branch, I had a short look around the Rocks Market. And came across this big wooden windmill, which as far as I could remember I had not seen before. Today, all was revealed when we received an email from Amber from The Nest in Surry Hills, who are partnering with the Sydney Foreshore Authority to work on their project, The Rocks Windmill. The windmill opened on 12 April and will run to 12 May and promises a month of workshops, performance, film, music and more. As part of the project, Bell Shakespeare is offering workshops during the school holidays, but also – and of more interest to us – an evening event, Theatre in The Rocks: Then and Now. This includes scenes from Henry IV and Nicholas Rowe’s The Tragedy of Jane Shore. And by the way, I do enjoy Shakespeare plays, even if I copped quite some disbelief on social media when I revealed that I watched his Richard III. Shakespeare’s plays are great on stage, that’s what they have always been intended for – not for the non-fiction history shelves of a library. Sounds like an interesting idea and well worth a trip into the Rocks area of Sydney. We wish the Nation’s Capital, Canberra, a very happy 100th birthday. Our best wishes go to all our members and friends in the ACT. If you live in or near the ACT you might like to join our members there who meet on an informal basis. Contact details can be found on our ‘Contact‘ page. The registration period for the 2013 Australasian Convention has been extended. So if you would like to attend please contact our branch secretary Julia quickly – to ask for more information or to send in your registration. You do not have to a member of one of the Australasian branches to attend. Convention is open to all members of the Richard III Society, wherever you live, as well as anyone else interested in the times. By July we should also know more about the test results from Leicester, so this is an opportunity not to be missed! The NSW Branch will be hosting the biennial Australasian Convention in 2013. All members and friends of the Richard III Society are welcome. Sunday, 14 July 2013, from 9h00: further presentations, plus a business session before our farewell buffet lunch in Dish restaurant. 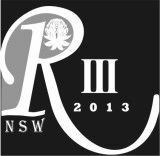 For further information and/or registration please contact the New South Wales Branch per email at info@richardiii-nsw.org.au. Let’s mark the 530th anniversary of Richard and Anne’s coronation with one big celebration! A reminder that your completed registration form and deposit for the biennial Australasian Convention in 2013 is due by by 31 December 2012! For further information and/or registration please contact the New South Wales Branch per email at info@richardiii-nsw.org.au. Please submit your completed registration form and deposit by 31 December 2012. The balance of payment is only due by 31 March 2013.